Angela Carter brought in Jeremiah, left, and Elija to meet nurses Autumn Thacker and Hannah Gregerson, but they slept through the reunion. When her doctor prescribed a “birth by appointment,” Angelica Carter thought she knew what she was getting into. After all, the Suisun City mother had labor induced seven years earlier, when her first son was born. Now pregnant with twins, her doctor scheduled delivery at 38 weeks gestation. But this time, things were different. Shortly after the IV was started about 5 p.m., the contractions became intense. Angelica was determined to have a drug-free and vaginal delivery, but by 9:30 p.m., the intense contractions were really sapping her resolve. “I finally agreed to an epidural,” she recalls. I knew it was an emergency, but everyone moved fast and did a great job. The umbilical cord is a flexible, tube-like structure that, during pregnancy, is the baby’s lifeline to the mother, delivering nutrients and oxygen. When the umbilical cord presents ahead of the baby’s body during delivery, it becomes a very serious complication. Angelica’s doctor tried to lift the baby’s head off the cord but was unsuccessful. “She said this was serious, that we’re going to have to do a C-section and we’re rushing you to surgery. There was no time even to grab my husband. Although Hannah could have clocked out at the end of her shift, she stayed alongside to provide some reassurance, and then the night team took over. 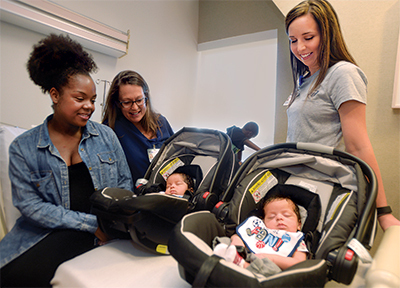 It’s the evening shift—from 3 p.m. to 11 p.m.—that seems to see the most action, Katie says, attributing the uptick in births to the number of inductions that were begun during the day shift. All day, every day, there are at least three Labor & Delivery nurses on shift, as well as an OB Tech and a Unit Clerk, who has an eye on the board that shows which rooms are occupied, and how far along in labor the patient may be. The Unit Clerk is at the hub of communication and the OB Tech ensures patient safety through constant readiness for any delivery or emergency. Each one of the eight Labor and Delivery rooms is treated as if it is an oasis of calm and quiet. Overseeing all is the lead nurse. Autumn Thacker, R.N., is one of several nurses to have this role, and she says it’s a perfect fit because her 12-hour schedule crosses all three shifts, allowing her to work with incoming and outgoing Labor & Delivery, Mother-Baby and NICU nurses and doctors, providing a valuable level of continuity in patient care. No matter the time of day, intensity of the patient load, or emergency situations such as Angelica’s, staff is determined to keep the chaos away from laboring moms, as part of the Baby-Friendly experience, Katie explains. Each one of the eight Labor and Delivery rooms is treated as if it is an oasis of calm and quiet so that the families and their newest members are able to focus on each other, bonding and building memories for life. NorthBay Healthcare was named a Baby-Friendly hospital in August, 2014, putting the facility in elite company not only in Solano County, but across the country. Only 14.4 percent of babies are born in the 286 hospitals or birthing centers that have earned the distinction.